Our Coton de Tulear Wilson is a mess!! He is now 4 months old and has had more baths than most dogs get in a lifetime!! WILSON LOVES MUD!!! He is a smart dog and knows what he should and should not do...but mud, he just can not stop himself. We are also having potty training issues. He will spend hours outside playing and come in and pee right by the back door!! AHHHHHHHH he might be the end of me. WE LOVE HIM!!!! Both of my little boys are diggers. Hopefully they will grow out of it. They truly seem to simply like the taste of dirt! Our Coton LOVES to go "potty" outside. We give her a tiny treat that comes out of the refrigerator after she goes outside. She jumps on us begging to go outside. When she comes in after going potty, she RUNS to the refrigerator door and sits down. She doesn't get a treat when she has an incident in the house. Works like a charm! I don't know about everyone Cotton. But, she lives to be with me all the time. I would not say that she loves digging in the mud. Just two days ago I was outside in my fenced in yard with sandy. I was going to plant some Black Berry plants. As, soon as Sandy saw that I was digging a hold. She got it in to her mind that dady needed help. So, she start digging holds around the fence. When all my holes was dug for the four plants I looked around and saw five more smaller holes that she had been working on.. Now came the fun part. As, I was back fulling my four Blackbarry plants. Sandy was right along side of me. The only thing was Sandy just learned to dig a hole a week a go from another dog. When she went down the ocean. You do not get muddy digging in the sand. So, every plant that I refilled Sandy took some mud away from them. The other dog forgot to teach her how to refill a hole. Looking back what a fun day we had that ended in a bath for each of us. you have to smile when looking at his muddy face!! just so cute, my little girl cotton has never been in mud but is a grass and weed magnet while on her walks. she to has had lots of baths . so hard to brush all the stuff out of her hair. are they not just so wonderful?? does he like to be groomed?? she does not!!!! looks like he really has fun, enjoy him! oh my..Maxine is the same..the more dirt,the more mud..the happier she is! I need to send her dirt picture as I swear she is smiling at me! Be consistent and say make pee while he is doing it and praise him like its a big deal. I put potty training pee pads right by the door out so he went on them. When I trained him outside I told him "go outside, make poo-pee" Then repeat that he is doing it, good boy!!!. Tuffy has a very large vocabulary now, at three years old, and I do believe he is also very telepathic! good luck with your mud lover! 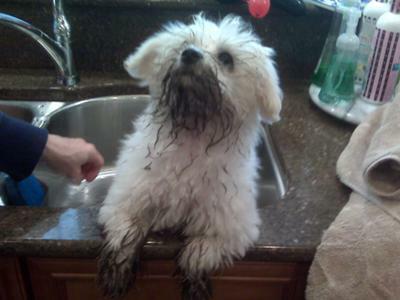 My coton Ripley also loves the dirt. He digs holes all the time in the garden and under trees. I think he loves the smell of dirt. I don't bath him each time because he would always be in the bath and he would go right back out and dig some more. I just wipe his paws and face and he ends up just licking himself clean. We were very lucky with house training. We used the bell attached to the back door and he learned very quickly. They are very smart dogs and yours should catch on soon.